How Does the Anti-Reflective Screen Work? The viewing window on our enclosures is made from scratch resistant acrylic. We use this material as it is very tough (it can survive accidental or intentional impact), and it is resistant to accidental scratching from dirt and dust being wiped across the front of the enclosure. Like glass, acrylic does reflect a proportion of light. This manifests itself to the human eye as a reflection of whatever is directly opposite the screen. When watching your TV/Display in daylight, this reflection can interfere with the vision being produced by the display. You see a reflection of the room or space “ghosting” over the top of the image being produced by the display. To combat this we offer an optional “Anti-Reflective” upgrade to the standard acrylic screen. So what does that mean exactly? An Anti-Reflective (AR) chemical treatment is applied to the Acrylic. This treatment reduces reflected light by up to 50%. This can be particularly noticeable during the day where reflections can distort the visibility of the images from the display. The AR treatment reduces light reflection by as much as 50%, increasing daytime readability of your display, and increasing contrast levels. The image above demonstrates this effect. On the left is an untreated viewing window. You can see that the TV’s image is being adversely affected by reflection. The reflected images from the surrounds are being confused with the image being displayed, creating a loss of clarity and contrast in the image. Conversely, on the right is a an AR treated viewing window. The reflections have been largely eliminated, allowing you to view an uninterrupted image from the TV. 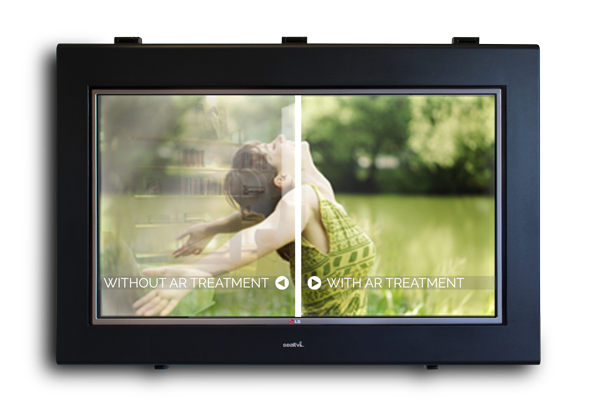 So, if the intended use of the enclosure includes a large portion of daytime viewing, or if the enclosure is installed in direct sunlight, we recommend upgrading to an anti-reflective (AR) treated acrylic screen. This entry was posted	on Monday, March 9th, 2015 at 7:37 pm	and is filed under Blog. You can follow any responses to this entry through the RSS 2.0 feed. Both comments and pings are currently closed.